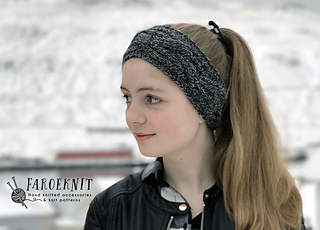 About 35g of Faroese Sock Wool by Navia, Col. 510 (The Gray/Black headband) or 35g of Snældan 3-ply, (the yellow Viking Gold headband) or other types of Worsted weight yarn, 9-wpi. 2 double pointed needles or a circular needle size 5 mm/US 8. Cable needle or one extra double pointed needle. Tapestry or wool needle. 30 sts and 28 rows per 10 cm/ 4 inches. Swatch is knitted in the cable pattern. 50 cm/20 inches in circumference and 10 cm/4 inches in height. 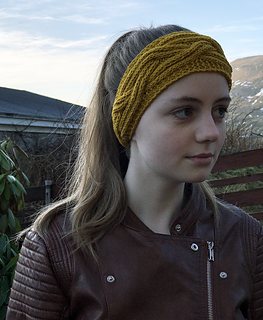 You can adjust height by casting on a few extra edge stitches on each side of the headband to make it wider. Instruction for knitting a children’s size, included in pattern.